A bone folder or bonefolder is a dull edged device used to fold professional looking creases, burnishing decorative papers, and scoring paper stock. It is widely used in crafts such as Japanese origami (artistic paper folding), scrapbooking, card making and any other craft where a sharp crease is needed. A traditional bone folder is carved from real animal bones and resembles a sharp ended popsicle stick. Our bone folders are made of a specially engineered non-stick material, which offers a number of benefits over bone and plastic. Customers tell us that one of the biggest benefits of our bone folder to is the non-stick properties, which means that adhesives, inks and paints will not stick to it. If you use a traditional bone folder today, you know its tendency to get worn down, discolored, and stained with age; this leads to messy clean up or worse, contamination of your next project. This is not the case with our bone folder; it will only get smoother and shinier with age while making clean up a snap. In fact, our biggest problem is that our bone folders last so long, once you buy one you will not need another one. 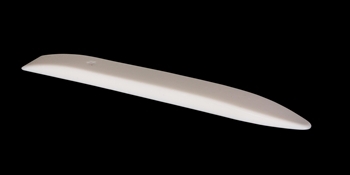 Another advantage of our bone folder is that it will not leave a shiny mark when rubbed over your work. While burnishing your decorative papers the bone folder's smooth finish imparts a glossiness or shininess to paper as it is drawn across a fold or crease giving it a professional look. The bone folder in effect smooths out the paper’s fibers acting like a polishing stone. We have many shapes available for various uses. If you don’t find what you are looking for drop us a note and chances are we can custom make one for you. If you are interested in other great tool ideas, check out our non-stick tweezers, spatulas, scissors, and scrapers. These have the same great non-stick characteristics as our folders.